I contacted Matt Kennedy about hiking into a waterfall that really not too many have seen: Punchbowl Falls. We left early on a Friday after a week of good rain and headed towards Richland. Upon arrival at Falling Water Falls we were greeted with fantastic water, especially for August! However, looking over the horizon we noticed a storm was brewing. Not wanting to hike in 3 miles in a downpour we made the decision to hang out around Richland Campground. An hour into fishing, that thunderstorm began to dump tons of rain on Richland Wilderness, so we took refuge in our vehicles; thankful that we hadn’t began our hike into Punchbowl falls. After the rain we both noticed there was a good layer of fog forming, and on top of that some great light. So we did what any good dedicated photographer would do. We hiked, quite literally, straight up a random mountain to a bluff line high above the Richland Campground! And people say standing in creeks is dedication… Hahaha! That is where we would find one of the best sunsets I’ve seen this year. 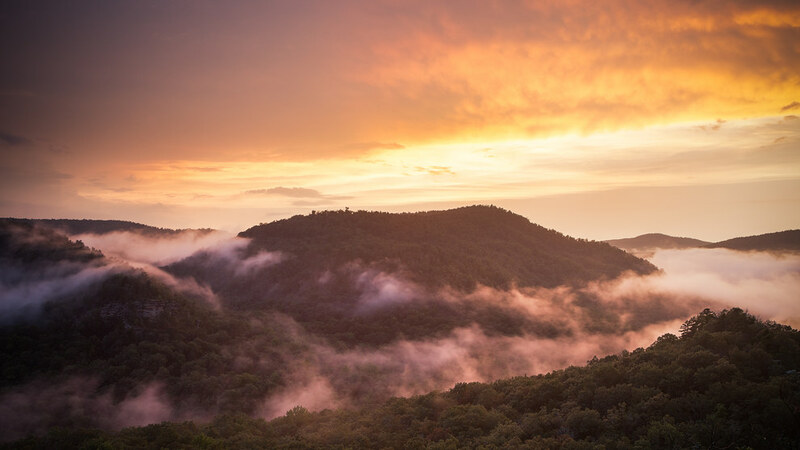 Nothing quite beats photographing a beautiful sunset on top of fog forming in one of the most spectacular areas of the state: Richland Wilderness!